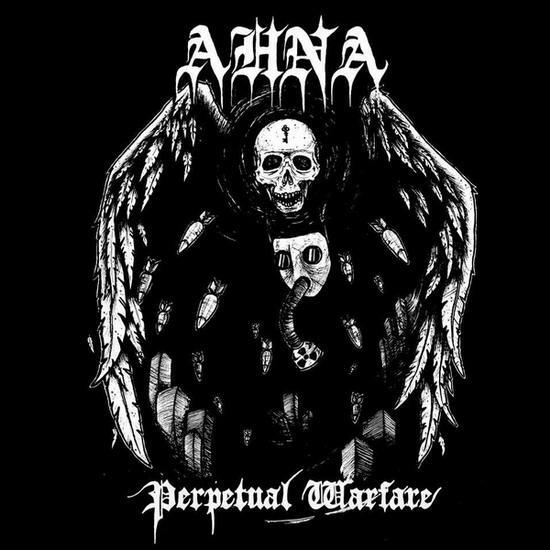 Hailing from Canada, Ahna formed in 2008 and started putting out material in the vein of extremely slow doom with heavy crust and black metal influence. After an LP in that style and a string of demos, splits, and EPs, Ahna has moved towards something that I’m infinitely more interested in: a mix of thrash, death metal, and crust. With a mixture lower pitched growls, higher pitched growls, yelled “clean” vocals that immediate remind one of Sacrilege, and a guitar tone (and a fair amount of riffs) hailing to the same band as well as to early Bolt Thrower, Ahna, on Perpetual Warfare, has created something that is, if not completely unique, is incredibly interesting and definitely moving towards there; in just over seventeen minutes, they provide a mixture between fast nonstop riffage based around groovy one-string melodies and occasional slower breakdowns that work incredibly well with the music and don’t at all detract from the high energy, headbanging groove that Ahna puts out whenever they’re not slowing down. The real standout that I really can’t emphasize the quality of enough are how great the little one-string hammered higher treshhold riffs are; they harken back to a couple of songs on Sacrilege’s debut, from what I can tell, but are used a bit differently and very effectly make this EP stand out massively from its contemporaries in other death/crust groups. The changes in pace and little breaks in between riffs at sections keep the EP interesting (though it’d take a pretty great failure to not manage to keep a seventeen minute EP from getting old), and the breakdowns that do exist, while used more frequently than many bands more rooted in metal would use them, are absolutely perfectly done and not at all distracting. The vocals also provide a momentum-carrying touch; the relatively uncommon mixture of yells and harsh vocals works extremely well here, and each type is just different enough that one could almost believe that Ahna is using three vocalists instead of the two that were actually involved. I actually can’t think of another band off of the top of my head that uses a mixture of cleaner yelled vocals and harsh ones quite as fluidly as I’m hearing on Perpetual Warfare; normally such a thing is distracting and annoys me, but the songwriting perfectly matches the vocals here and I have no complaints about it. The only particularly uneven thing about this EP is that some of the songs- especially on the second half of it- utilize growls a lot more than the Tam Simpson-esque yelling, and considering how much I absolutely love the Tam type yells, I find that a bit disappointing that the yells are phased out towards the end; however, that really is a petty complaint when stacked against the constant and incredible riffing and the fact that even as the yells stop, the quality continues overall. In the last few days since I first heard this, I’ve listened to it about four times a day minimum, and while I doubt that such frequency will last, the love that I’ve been giving it surely will; for that, I have to thank the wonderful Derek of BEGRIME EXEMIOUS for recommending it.